A deodorising Salt scrub specially formulated to be used on the feet, containing Peppermint, Tea Tree and Grapefruit essential oils, all contributing to the odour reduction, relaxation and stimulus of the feet. 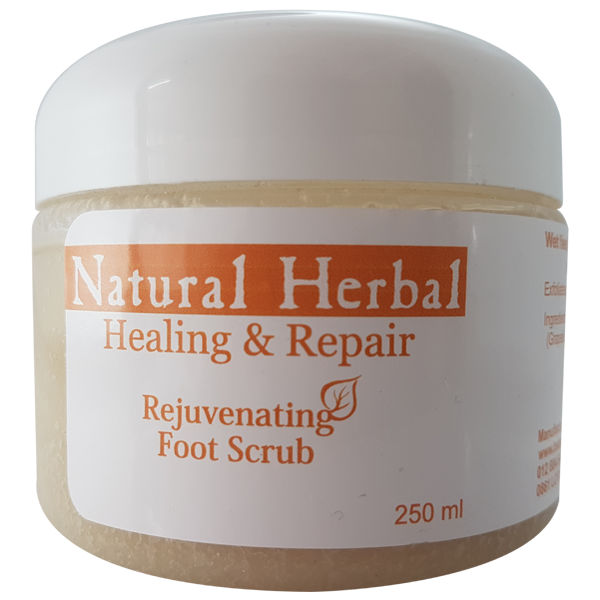 Healing & Repair Range Rejuvenating Foot Scrub combines the properties of Peppermint, Grapefruit and Tea Tree Essentials oil to stimulate and refresh the feet, while gently deodorising. Grapefruit oil is known to have cleansing antioxidant properties while Peppermint oil has a cooling and refreshing effect. It also deodorises with it’s antifungal and antibacterial qualities. Tea Tree oil hasfurther cleansing, anti-microbial and stimulating effects on the feet. It also acts as a good antioxidant which draws out any toxins within the skin cells of the feet. After use feet feel smooth, soft and cared for. Wet feet, and apply scrub to hands. Exfoliate in Circular motions to remove dead skin cells. Rinse with lukewarm water when complete. Removes all the dead skin cells and stimulates blood circulation, leaving the skin felling soft and rejuvenated.